RAS 2019 Notification (आरएएस परीक्ष ा: अधिसूचना, आवेदन पत्र, परीक्षा दिनांक और पाठ्यक्रम): Good news for those candidates searching the Government Jobs in the Rajasthan State. The Rajasthan Public Service Commission has announced the RAS Recruitment Notification on their official website. Applicants are invited to check the notification Pdf when it is available in the below section. 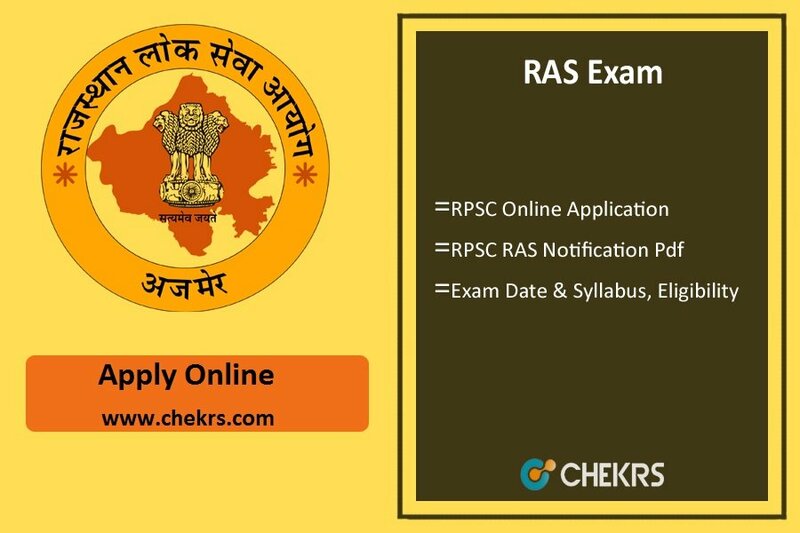 You can check the RAS 2019 Exam Date, Selection Process, Syllabus, Exam Pattern, Application Process & etc details from here. The Rajasthan Administration Service Exam 2019 will be organized in the upcoming months by the Rajasthan Public Service Commission (RPSC). All the candidates of Rajasthan administration department willing to work for welfare and development of Rajasthan state will have to fill the RPSC RAS Online Application. Here we have shared the complete details of RAS 2019 such as eligibility criteria, age limit, how to apply online process & more information. So, candidates are informed to must read the whole article and can apply for the RAS Examination. The Rajasthan Public Service Commission has announced the RAS vacancy details for the different departments. According to updates, RPSC has decided to recruits the well skilled and eligible candidates for the RAS posts. You can check the vacancy reservation details through the given table. All the eligible candidates applying for RAS can submit their online application form on or before the last date. After passed the last date, the Rajasthan RAS Application Form will not be accepted by the RPSC Department. Here we have provided the process of filling the application form which is given below. RPSC has decided the eligibility criteria for the candidates willing to participate in the RAS Examination. The RPSC RAS Eligibility Condition can be defined as the basic criteria that the interested candidates have to fulfill before applying online. Go to the official website of Rajasthan Public Service Commission. Click on the RPSC Online Section. Search for the RAS/ RTS Comp. Exam 2019 link and click on it. A Pdf will be open and read the instructions carefully. Enter the token number and date of birth details. Choose the Exam & Post Name. Fill the all mandatory details in the application form with correct information. And upload the Scanned Photograph & Signature in the prescribed format. Note down the Registration or Application ID and can take a print out of application form for the future uses. The RAS Exam Schedule will be released along with the recruitment notification on the official website. Here we have shared the tentative exam date table for the candidate’s convenience and can start their exam preparation. RPSC has been released the RPSC RAS Syllabus 2019 for the exam study. The exam syllabus has provided all topics which will be important for the RAs Examination. If the candidates are well aware of the syllabus for RAS will be able to prepare in a better way. General Knowledge Politics, history, Economics, Arts, current affairs, daily news, New facts & famous dates, Indian constitution, Geography, Basic mathematics, English & Hindi grammar etc. Modern Indian Language Comprehensive Passages, Brief Writing, Vocabulary, Short Essay, Translation from English to the Indian Language & vice versa. General Knowledge -2 Constitution, Social Justice, Internal Relations, Economics, Governance Politics. General Knowledge -3 Modern Technology, Economic Development in Rajasthan, Environmental issues, Security Management, Disaster Management & ethics, Bio-Diversity. General Knowledge -4 Ethics, Integrity, Aptitude: Logarithm, Percentages, Profit, Loss and Discount, Interest (Simple and Compound), Progressions (Sequences & Series), Binomial Theorem, Surds and Indices, Quadratic Equations, Complex Numbers Inequalities, Permutation and Combination, Probability, Functions, Set Theory, Mixtures and Allegations, Geometry, Co-ordinate Geometry, Trigonometry, Mensuration, Number Systems Speed, Time and Distance, Time and Work, LCM and HCF, Averages, Ratio and Proportion, Linear Equations. RAS Open Competitive Examination Admit Card of the registered candidates is released officially. Candidate’s who are registered for the examination expect online admit card, no further RAS Admit Card is sent to the candidates by post. Generally, RAS pre & main examination admit card are released approximately 10-12 days prior to the examination. Applied candidates can make note of all the exam relevant details beforehand and could reach the examination center comfortably. Today in order to groom our preparation level as well as to keep a track of how much we have assessed mock test papers plays a vital role. RAS Exam Mock Test is the mock version of actual examination and practice on sample papers/ model papers on a regular basis actually enhance your preparation level. Sometimes in order to reach the vast syllabus, we forget to revise the actual syllabus, thus always try to wrap up the syllabus first which is important from exam perspective. This will help you to keep a track of each and every subject. And revising the syllabus in a particular time frame also increases our working efficiency. As well as the level of examination and trend of questions too. After attempting mock test paper analyze it thoroughly so that you can get track of mistakes which you are committing and next time when you begin practice on mock papers you can reduce silly mistakes and this way you can increase your accuracy level. This will help you to be updated with the current news and events which are happening around you. Always try to revise the syllabus in a very calm and composed manner with a positive attitude. Answer key of RAS preliminary and Main examination are published officially. Generally, the RAS Answer Key is published a couple of days after the examination. The exam conducting authority (RPSC) declares prelims and main examination results separately on its official site. Candidates who appeared for the examination, they can check RAS Exam Result status by login with the login credentials such as roll number and DOB. RPSC RAS Exam Result is declared in PDF format. In this PDF all the registered candidate’s names are listed and subsequently their marks, category, cut off marks. Selection board shortlists the candidates on the basis of cut off marks. Those candidates who qualify the RPSC RAS Cut Off Marks are shortlisted for further rounds, be it the main examination, personality test & document verification. The board set a separate cut off a benchmark for all the subsequent rounds. And in order to qualify a particular round, a candidate is required to qualify the preceding round cut off criteria. RAS combine competitive examination merit list is drawn on the basis of performance of the appeared candidates in each round of selection. Candidates appeared for the examination, they are registered for the RPSC RAS Merit List at the time of final result declaration. Candidates who book their names for provisional selection their names are getting listed on merit list and the board made available on the official website. You can get more update on RAS 2019 Notification to keep in touch our website www.jobs.chekrs.com. In the case of any query or review, your valuable comments are most welcome in the commenting section below and our team will get in touch with you shortly. I am from haryana… MA IN MUSIC… Not b.ad…. Kia MA music ke sath b.ad hona jaruri h.?